Holly in the understorey in a Thorburn painting. There’s no symbol more synonymous with Christmas than holly. Every December the dark-green, spiky leaves and bright red berries are everywhere. They feature in our songs, on our Christmas cards and adorn our homes. Johnny Scott considers how holly became such an important symbol in our culture. 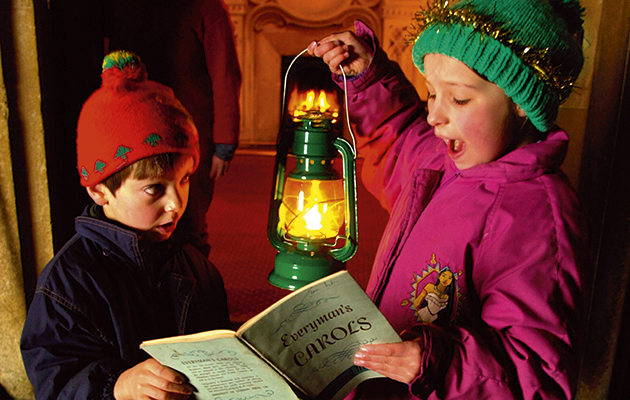 For more on the history behind our festive traditions, read the history of Christmas crackers. Or learn about the creatures that feature in our seasonal tales in Christmas animals: bestiary of a feast day. 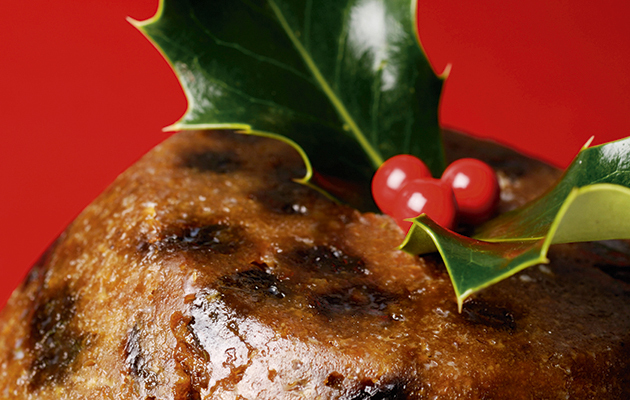 Holly is one of the most recognisable symbols of Christmas. Of all the symbols of Christmas, none is more synonymous with the spirit of goodwill, peace and joy than holly with its shiny, dark-green, spiky leaves and brilliant, blood-red berries. Holly is everywhere at Christmas; it is sung of in carols; is the principal illustration on thousands of Christmas cards and the stuff of welcoming wreaths; it decorates our homes and no flaming Christmas plum pudding is properly dressed without a sprig of holly berries browning in the flames. Since the 1850s, when the Victorians created Christmas as we know it today, tons of holly have been auctioned annually at the Tenbury Wells Holly and Mistletoe auction. Tenbury Wells sits beside the River Teme where Shropshire, Worcestershire and Herefordshire meet in an area particularly suited to holly. 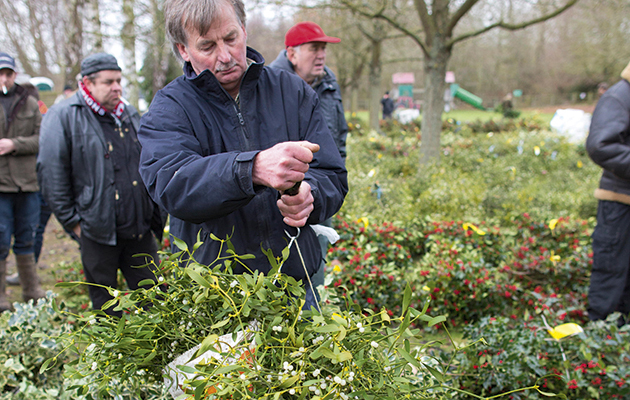 For 150 years, the holly and mistletoe sales took place in the town’s old cattle market but nowadays they are held on the last Tuesday of November and the first two Tuesdays of December by auctioneer Nick Champion at the Burford House Garden Store. 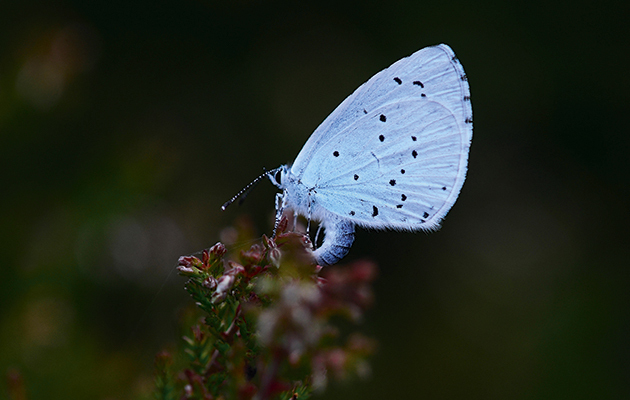 The holly blue pollinates the female tree. or the understorey of deciduous woodland, although it can form dense thickets or groves as the dominant species, growing to 15 metres over a period of several hundred years. 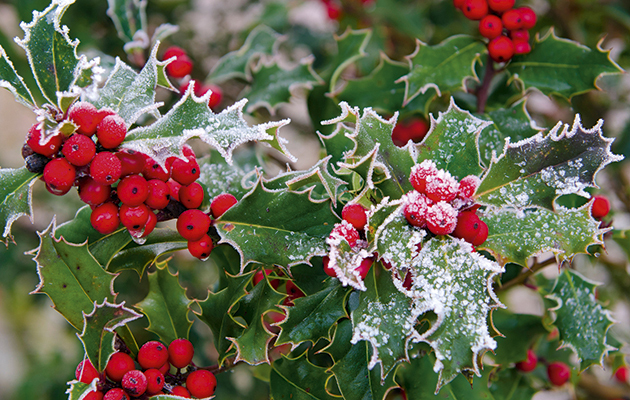 Holly is dioecious, meaning that male and female flowers occur on different trees, with the female pollinated by bees and other insects, such as the holly blue butterfly and various moths, including the yellow-barred brindle, double-striped pug and holly tortrix. The berries, which ripen in November, provide winter food for a variety of birds, among them thrushes, blackbirds, jays, robins and Arctic migrants such as redwings, waxwings and fieldfares, while the deep leaf provides habitat for hibernants. Until the late 18th century, when botanists discovered they were produced exclusively by females, thus debunking much folklore, the berries were believed to be carried by male plants. The leaves of holly were once a valuable winter stock feed, particularly across moorland of the north Midlands, with holly groves deliberately planted and preserved for that purpose. 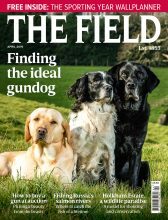 The name “holly” derives from the Anglo Saxon holegn, and a grove of holly trees became known as a “Hag of Hollins,” with the word preserved in hundreds of place names, such as Hollinsend near Sheffield, Hollingworth in Cheshire and Hollin Busk and Hollin Edge Height near Bolsterstone in Yorkshire. The spikes on holly leaves gradually disappear as the tree grows taller and hollins were pollarded, with the branches fed to stock.  Farm rents were adjusted upward depending on the number of trees in the hag. Feeding holly was gradually phased out with the introduction of turnips during the agricultural revolution. Few ancient hollin hags remain. There is one near Snailbeach in Shropshire. 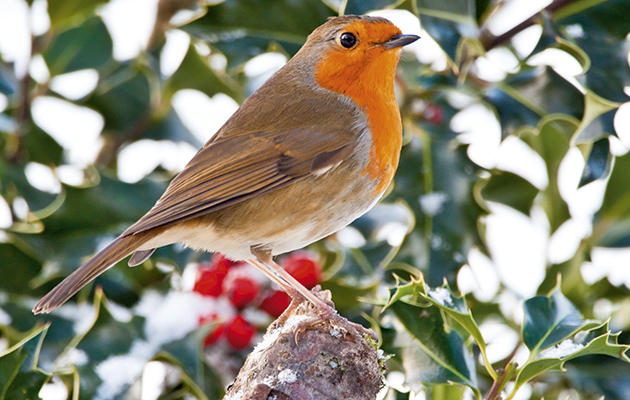 Holly berries provide food for robins. Holly had been revered long before Christianity as a crucial element in the pagan midwinter solstice celebrations, the most prolonged and widespread fertility festival worshipping the Unconquered Sun. To early people, such as the Iron Age Celts, dreading the barren bleakness of winter, the sight of a holly tree standing lush, green and aglow with scarlet berries when all other plant life had died, would have been an emblem of hope and a promise from the deities of regrowth to come. To add to the mystique, holly most commonly grows in the understorey of oak woodlands, where few plants can survive the overhang of a mature tree. Oaks were sacred to the Druids as the hosts of mistletoe, the “Golden Bough”, and they believed that once the leaves fell from the oak, its spirit moved to the holly growing nearby. The first recorded usage was by the Romans during Saturnalia, the week-long celebrations held in mid-December honouring the agricultural deity, Saturn. It was a time described by the poet Catullus as “the best of days”, when all the accepted codes of conduct were reversed: men dressed as women and masters as servants. There were pageants, licentious plays orchestrated by a Lord of Misrule, banqueting, bonfires, drunkenness and abandoned dancing. Houses and streets were decorated with holly, ivy and other evergreens, and strenae (twigs of evergreens – laurel or holly) to which were fastened sweetmeats, were given as presents. Annual Holly and Mistletoe Auction, Tenbury Wells, Worcestershire. 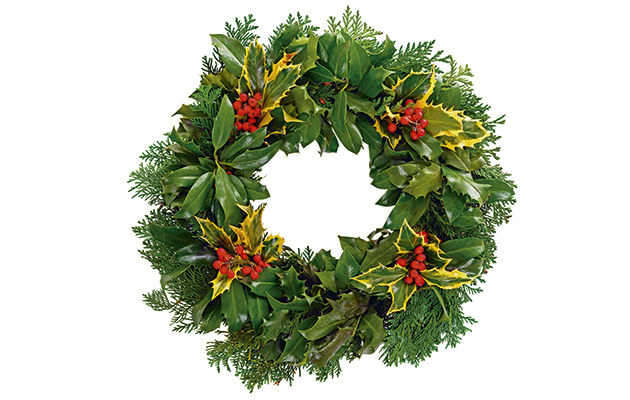 The early Christian converts decorated their houses with holly and evergreens over this period, as much out of previous habit as protection from persecution during the revels. The custom persisted as Christianity spread, despite stark warnings in the fourth century from Archbishop Gregory of Constantinople and an attempt to ban it altogether in AD572, by Bishop Martin of Braga. Common sense had prevailed by AD 595 when Pope Gregory sent a mission of 40 monks led by Augustine, the Prior of the Abbey of St Anthony in Rome and later the first Archbishop of Canterbury, to England with instructions to convert the pagan inhabitants to Christianity. Pope Gregory’s mandate to Augustine was brilliant in its simplicity. He surmised, accurately, that the easygoing Saxon population would not object if the seasonal festivals of the pagan calendar were Christianised, as long as no one interfered with the actual celebrations. Holly adorns the wreaths we hang on our front doors at Christmas. Conversion through gradual coercion took several centuries, but eventually Saturnalia – or Yule, as it was known to the Saxons – became the celebration of Christ’s birth, with the traditional winter solstice woodland decorations remaining unaltered. Because of its significance to pagan beliefs, holly became more Christianised than any other plant: the Church claimed the red berries represented Christ’s blood at the crucifixion and the spiky leaves, the crown of thorns. This notion became so ingrained in the collective psyche that holly became known as Christ’s Thorn or Holy Tree, the name William Turner, the Elizabethan natural historian gives in his New Herball of 1568. The traditional use of holly, ivy and other winter evergreens was not eliminated, as a rather cryptic entry in the ancient calendar of the Church of Rome suggests; templa exornantur – churches are decked. During the mediaeval period, Christmas remained a time of feasting and merrymaking; it was predominantly a secular celebration with a few token religious elements thrown in to keep the Church happy. The antiquary John Stowe gives a description of Christmas in the 15th and 16th centuries in his Survay of London (1598): “ In the feast of Christmas, there was in the King’s house, wheresoever he was lodged a lord of misrule, or master of merry disport, and the like had ye in the house of every nobleman of honour or good worship, were he spiritual or temporal.” He records that every man’s house, the parish churches, the conduits where the people of London drew water and the boundary standards of the different wards were decked with holly, ivy and bay leaves. Church wardens’ accounts from the early 16th century show expenditure for holly and ivy at Christmas. Amusingly, the Church of St Margaret, in the grounds of Westminster Abbey, was still defiantly being decorated with winter evergreens in 1647, the year Christmas was banned by the Puritan Parliament as “ a popish festival with no biblical justification”. Holly has always been a popular theme in Christmas carols. Song was an important part of pagan winter solstice festivals and these were to become semi-religious ballads – the origin of our Christmas carols – in which a curious relationship between the holly tree and the ivy plant appears to have been a popular topic. Common ivy, Hedera helix, was held in high esteem by early people; it was dedicated to Bacchus, the Roman god of drunkenness, and its leaves, bound round the brow or added to wine, were believed to prevent intoxication. It was an emblem of fidelity and for that reason, Greek priests always presented newlyweds with a wreath of ivy after the marriage ceremony. From the early Middle Ages right up to the Interregnum when Christmas was banned, a number of ballads, poems and love songs were written about the two plants. Henry VIII even wrote one alluding to his love for a “lady true” enduring, as holly and ivy retain their evergreen vibrancy despite the harshest winter. Singing contests between men and women were a popular Christmas pastime, with men extolling the virtues of the “masculine” qualities of holly, while women praised the “feminine” qualities of ivy. An example dating from the 14th century is among the Harleian Collection of manuscripts in the British Library. Everyone’s favourite Christmas carol, The Holly and the Ivy, probably dates from this period. Scotland especially believed that holly could ward off malign presences. The belief that plants with winter berries – holly, ivy and yew – were a defence against a malign presence was particularly strong in Scotland. The Gaelic name for holly, chuillin, appears across the country from Cruach-doire-cuilean on Mull, where the McLeans of Duart adopted holly as their clan badge, to Loch a’Chuillin in Ross-shire in the north; the town of Cullen in Banffshire may have derived its name from a local holly wood. In Scottish myth, the cailleach, a hag representing winter, was born each year at the beginning of November. She stalked the earth during the winter, smiting the ground with her staff to harden it and kill off growth, while calling down the snow. On May Eve, the turning point of the Celtic year, she threw her staff under a holly tree and turned into a stone. The holly tree was sacred to her and keeping a holly bough, with its leaves and berries, in the house was believed to placate her and protect the occupants from her unwelcome visit. Many homes in the north have a holly tree growing close to the building. After the Battle of Dunbar in 1650, when Cromwell defeated the Scottish army commanded by Lord Newark, 5,000 prisoners were force-marched under appalling conditions to Norfolk to drain the fens. The 1,400 who survived the journey were said to have stuck holly twigs around the hovels in which they had to live. Holly was believed to frighten off witches and protect the home from being struck by lightning. Many old houses, such as ours north of the Border, have a holly tree growing close to the building. 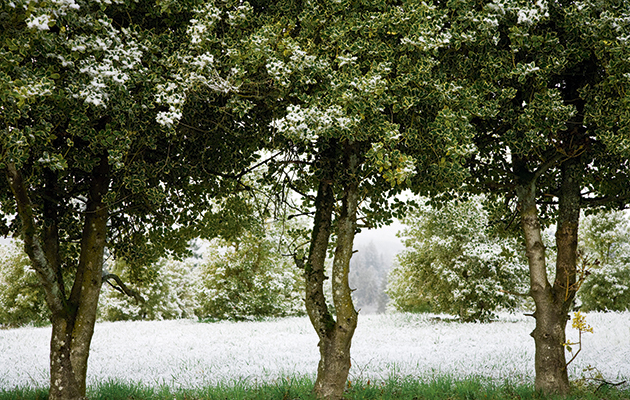 Curiously enough, these properties were first mentioned by the Roman naturalist Pliny the Elder (AD 23-79 ) who further believed that the tiny white flowers, which blossom in May, caused water to freeze and that a piece of holly wood thrown at any animal compelled it immediately to lie down where the wood landed. Although the berries are toxic to humans, holly leaves contain laxatine and ilicin and were once used to treat rheumatic fever, while the bark was boiled by bird catchers to make bird lime. The wood is hard, compact and evenly grained, with a colour similar to old ivory. It is prized by stick dressers, in marquetry and as a substitute for ebony when dyed black. Because of the ancient belief that the wood had a mystical control over animals, coachmen’s whips were made from coppiced holly, which accounted for thousands of holly stems during the great era of carriage driving in the 18th and 19th centuries, and there was a tradition that a coachman should be buried with his whip. Happy Christmas to you all!